“Hello, Gorgeous!” Just like Barbara, stop, look in the mirror and say it! Bright, almost white, Sterling Silver. 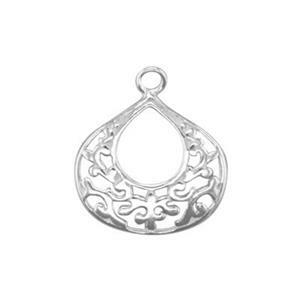 Open Lacework in a tiny, chubby cheeked teardrop dangle. These delicately detailed drops have a 1.4mm closed inside diameter ring on them – so you can just slip them onto an ear wire for a quick and elegant design. Or you can add your own open jump ring to build on an even more dramatic jewelry piece.